Can't believe it's already september, man time sure does fly by fast! Feels like it was yesterday when I was planning all my summer recipes and all of a sudden my birthday is around the corner (panic!). What should I do this year? Should I bake my own birthday cake or should I take a break that week and let others do the job? All my fellow bakers and food bloggers will understand me when I say that I can't help but seeing this as an opportunity to try a new cake recipe. Yeah, I know...maybe some might say it's a bit lame to bake your own birthday cake or that I should just be a spoiled birthday gal. There are two weeks left for my b-day so I still have some time to make my mind up. Cakes and dilemmas appart, I bring you today a summery rustic galette. 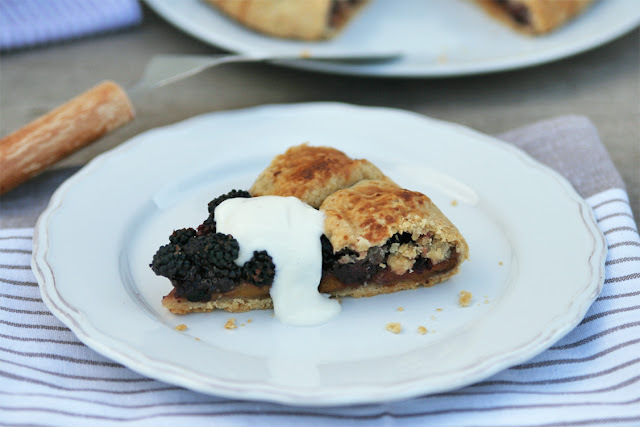 It's super easy to make and foolproof, the good thing about galettes is that you can use almost any kind of fruit and try your favorite combinations of berries and adjust the sweetness to your taste. 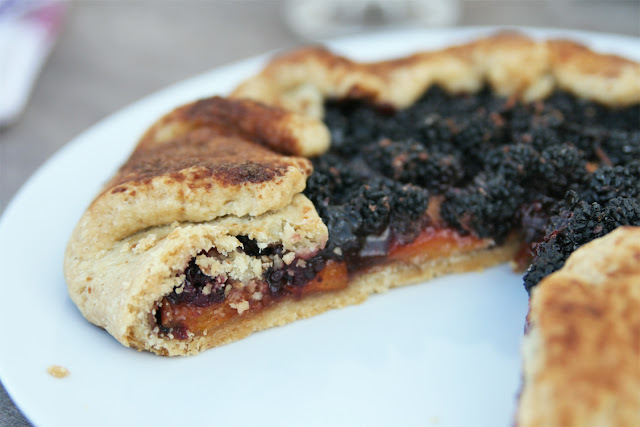 This blackberry and peach galette is actually good for you because it only has a few tablespoons of sugar and the rest of the ingredients are all super natural and healthy. 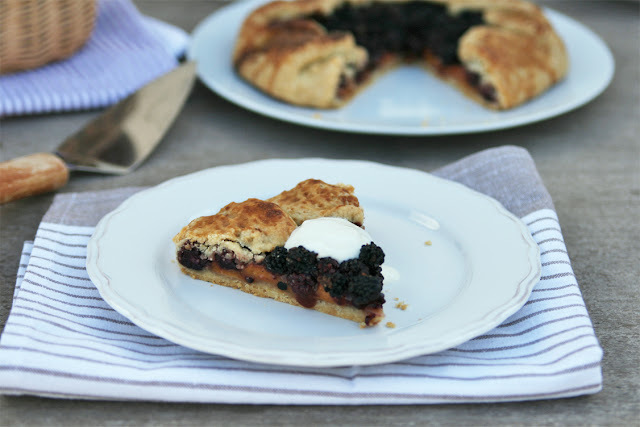 The olive oil crust is my go to crust for all my pies, tarts and galettes; the toasted flaky edges are so delicious! There's something special and beautiful about rustic galettes and their juicy fillings, they give me a sense of coziness that I can't put into words. It's like when I put the first spoonful of my mom's rice pudding in my mouth, nothing feels like homemade desserts...specially if they are made with love. 3 large sweet peaches, sliced. 2 tbsp organic granulated sugar, plus an extra tablespoon for sprinkling. 1 to 2 tbsp all purpose flour. 1 tbsp soy milk (for brushing the crust). - For the crust: see my olive oil double crust. Prepare the olive oil double crust from my Cashew Apple Pie recipe (link above in 'Ingredients'). 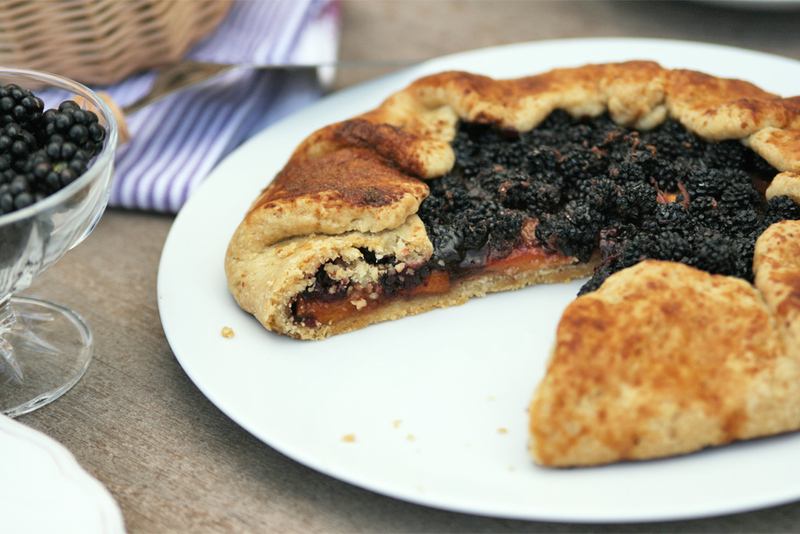 Don't divide the dough cause we need the crust to be big and thick enough to hold all the juicy filling and fold over. 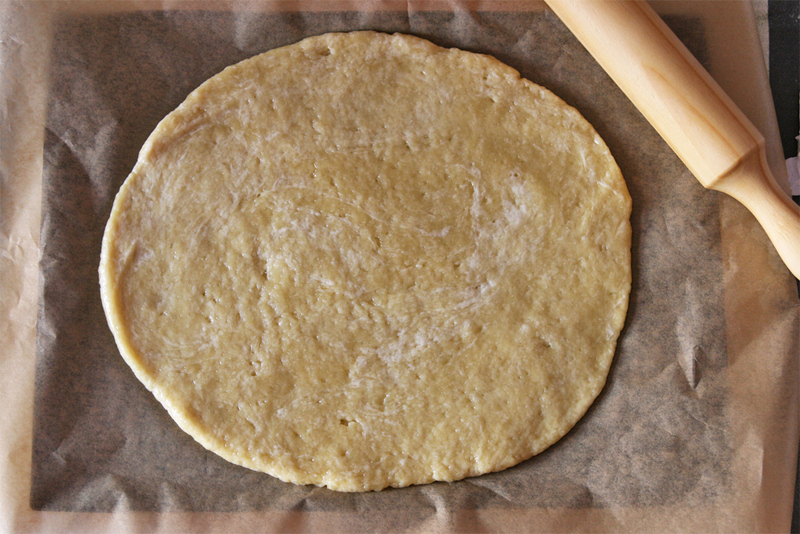 Roll the dough into a ball and flatten into a big disk. Place a big piece of parchment paper on your working surface and roll out the dough, remember it shouldn't be too thin cause the filling is quite juicy. Refrigerate for 30 to 45 minutes. Preheat oven to 425 º F (218 ºC). In a large mixing bowl combine peaches, blackberries, sugar, lemon juice, cornstarch and flour. Let sit for 10 minutes approximately. Transfer the fruit mixture to the centre of the rolled dough and sprinkle the lemon zest, vanilla, nutmeg and an extra tablespoon (or two) of sugar on top. Fold the edges of the crust over the filling to form a border. Carefully transfer the galette to a prepared baking sheet. Brush the borders with milk and sprinkle a bit of sugar. Bake the galette for 25 minutes, then lower the heat to 350 ºF (180 ºC) and bake for another 30-35 minutes. The crust should be golden brown and the filling should be bubbly. Transfer galette on a cooling rack and let cool before serving. - A dollop of natural soy yogurt with maple syrup drizzled on top. - A scoop of your favorite vanilla ice cream. 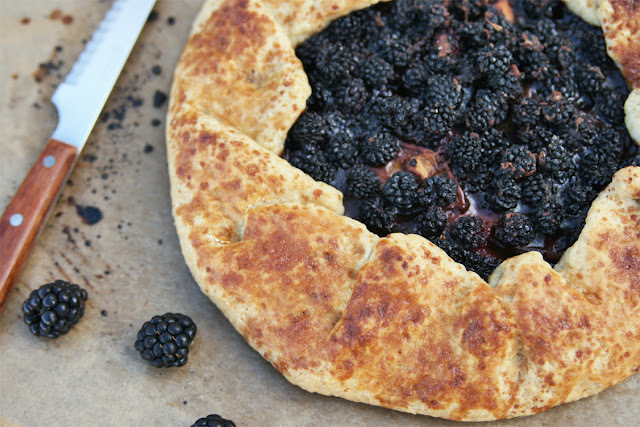 Looks awesome blackberry and peach sounds like a great flavour combo. I hope you have a good birthday when it comes. I do love seeing your cake creations so I would selfishly say make one, but I think you deserve to be treated and get someone else to bake one for you. I'm still thinking about wether or not bake my own bday cake...I have some cool ideas...!